Bats In Attic or A Raccoon Living In Your Attic? 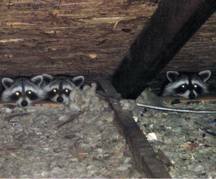 Are Bat or Raccoons In Your Attic or on your Property? If it is either one, your families Safety and Health could be at risk. Both carry bacterial diseases that if not removed and the areas not properly sanitized, might or could cause serious illness to you or a family member. Know It. They Are Looking For A Home For The Coming Months !!! 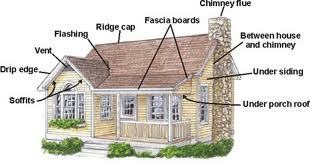 Has it been their desired [Bats or Raccoons] to seek a safe warm residence with food source to raise their family? Now with the "CHILL" approaching, they may be coming forth with your home in mind ?? Is that the noise you've been hearing in your attic ?? 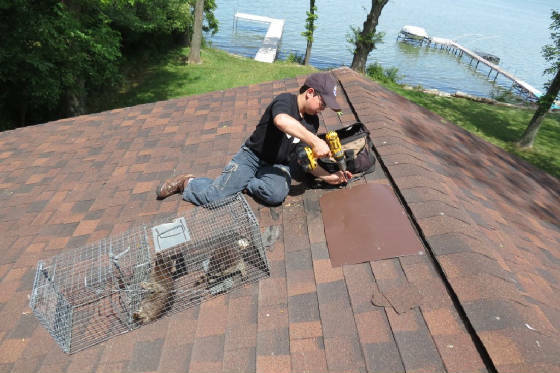 Winter In Ohio Is Not A Time For Relaxing, Because Raccoons or Bat Activity May Prevail In Your Attic. As many Ohio residents welcome Winter with the chill in the air and the beauty of snow. The Big Brown Bat emerges from the warm place that has keep him/her warm during the previous months. Bats are specialists at finding openings, as small as 1/2 of an inch, that will allow them to enter your residence, also Ms. Raccoon will make an opening to find warmth and a place to raise her pups. Winter is a good time to conduct an exclusion since bats or raccoons are with their family and are inactive. During that time, an inspection could help identify if a maternity colony or a small group of males are present. The males roost in a different location than the maternity colony. 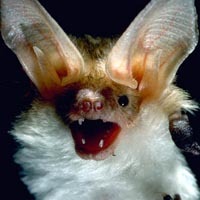 If you have a maternity colony present, then special care must be taken to consider the young non-flying bats. If a maternity colony is present, we begin the bat exclusion, however we must temporarily leave an exit open so the females can return to feed the pups. Once the young bats can fly, we return to install the one way bat exclusion doors. It only takes time to add the one-way doors and many of the bats will depart that evening, ridding your home of the entire colony within days. This process ensures that your home is bat free as soon as possible, rather than trying to get on our exclusion schedule during the busiest time of the year. A Commercial Certified Nuisance Wild Animal Control Operator by the State of Ohio (CNWACO). 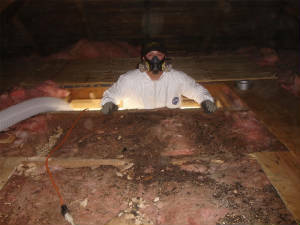 Removal of Urine and Feces Contaminated Attic Insulation, Replace With New Insulation. HEALTH MUST BE THE 1st CONCERN.